Toshiba ET20 – Super Close Projector | OhGizmo! 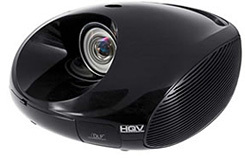 It’s nice to see a projector with a built-in DVD player, but what makes the Toshiba et20 really stand out is its Super Close Projection Lens that produces a 2 meter image (measured diagonally) from only 1 meter away! The et20 also employs the Realta HQV 10-bit video processor. It uses full four-field motion-adaptive video deinterlacing, pixel-by-pixel temporal-recursive noise reduction, automatic film-mode detection and pixel-based detail enhancement which is all designed to help the image coming from a standard DVD look more like HD. On top of all that the et20 also has built in 5.1 channel surround sound. The Toshiba et20 should be available sometime in April 2006 for about $1900.